Ben Aipa "2018 Surf Pioneer"
PHOTO: Shaping room with Duke Aipa, Larry Bertlemann and Ben Aipa. PHOTO: Aipa at Kaisers 1976. Courtesy Ben Aipa, photo by Bolster. PHOTO: Mark Richards with Aipa quiver. Courtesy Aipa family. A true renaissance man during surfing’s golden ages, Ben Aipa spanned the spectrum from worthy competitor to top-tier boardbuilder to coach of Hawaii’s best surfers. The well-built son of a sugar plantation worker, Aipa’s first love was football. 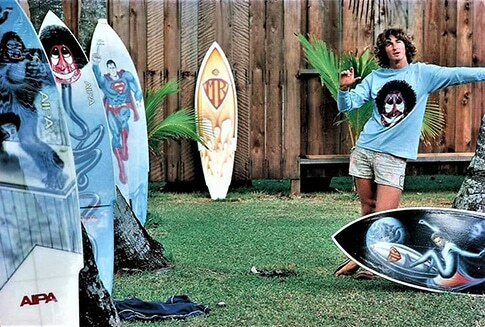 And not until an ankle injury sidelined him from his semi-pro career, did he begin surfing in his early 20s. With an athletic mindset, Aipa quickly progressed and was a finalist in the Duke Kahanamoku Classic at Sunset Beach in 1965. He finished fourth in both the 1967 Lightning Bolt Pro and Makaha International and competed in the World Championships in 1968 and 1970. In 1966, he began shaping surfboards and two years later Fred Hemmings won the World Championships on his design. Aipa Surfboards was officially established in 1970 and he’s widely credited for inventing the swallow tail (named after the bird) and taking it one step further by adding the “sting” — a wing along the rail ahead of the tail. His son Akila Aipa is also a renowned Hawaiian shaper. Aipa’s designs were ridden by Larry Bertlemann, Michael Ho, Buttons Kaluhiokalani and Mark Liddell in competition, where Aipa served as an informal coach/trainer for the surfers. He continued to coach in the following years, working with the likes of Brad Gerlach, Sunny Garcia, Kalani Robb and Bruce and Andy Irons. PHOTO: Legendary Buttons and Ben Aipa with quiver. PHOTO: Ben Aipa at Waikiki. Photo courtesy of Aipa family. PHOTO: Courtesy of Aipa family.